I've been very fortunate to have regular lessons with Joan this summer for the first time in years. She's wanted us to review things from the beginning and it's been immeasurably useful. It's been said many times, but you just can't beat good basics. 1. Lack of moving away from my leg promptly for lateral work - we did and continue to do turn on the forehand until I can completely control each step - the size of the step, the start and stop of the step, a forward thinking step while keeping the front legs stepping in a tiny circle, doing it in perfect walk steps. I'm still working on getting it as close to perfect as we can. In keeping with the instructions in Arthur Kottas's first book we mostly turn just 180 degrees, then walk off, to keep the thinking forward. After Arthur Kottas was here in May Joan got a copy of his book too, so she can teach me using his methods. She was taught mostly the Spanish Riding School method, so it fits with everything she's taught me anyway. 2. Slouchy transitions from trot to walk - I still, after all these years, don't have a good version of this most basic transition. What I want of course is a clear, distinct end to the trot and beginning of a forward, uphill, marching walk. Savanah and I had a great trot walk transition - smooth and seamless, distinct, forward - so I know I can do it. I can't seem to communicate clearly to Rogo what it is that I want. Most of the time it isn't terrible, but it can be much better. He seems to think I want a slow trot when I ask for walk and then he sort of falls into the walk and has to be pushed forward again. I'm working at keeping the energy up through the transition, and asking more 'definitely' if a soft aid isn't clear, then backing off to soft as his response improves. Does anyone else have a weakness with this and if so how have you addressed it? 3. We're doing ALOT of stretchy trot circles. First we do a slower, working trot on a large circle, then I push him into a medium trot and do a unilateral half halt on the inside, as light as possible while still getting a reaction, so he'll seek connection on the outside and also stretch down. When he stretches down I slow the trot again and gather the reins, then repeat. I have to say, this exercise was an eye opener for me because it is slightly different than I've done it before and at first I found it, well, kind of annoying. Why would I slow his trot down to start the exercise and throughout the exercise? Coming back from those months off (lame left front) his slow trot was awful - on his forehand and if I wasn't super careful he'd hitch. Yuk. It was great when I'd push him forward - he'd stretch down very nicely and fairly quickly he learned to round and reach into a lovely connection as soon as he felt me ask him to go forward. One day though a light bulb went off regarding why we were varying it with slowing the trot and gathering the reins - I asked for the slow trot and it was lovely - a slower version of the connected, round trot I was getting when I asked him to go forward and stretch. Yes! He slowed down, but kept his hind quarters under him and bounced along. We were / are slowly developing collected trot and I didn't even see it coming :). Of course we've slowed down and accelerated the trot, as well as shortening and lengthening the steps for years now, and there are many good exercises for developing collection, but I have to say that this particular exercise is a good one. It also has the benefit of straightening the horse when practised in the direction of the stiff side - the half halt on the inside teaches the horse to reach for the connection on the outside where they tend to avoid it. All in all a great variation on the stretchy circle. We've also been brushing up on leg yield and shoulder in, and practicing walk / canter / walk. Lots of basics but we missed a lot of time and this is definitely filling in gaps. It isn't the first time and won't be the last time we've gone back to basics. One of my biggest goals now is keeping a soft, steady connection through transitions. Again, it isn't terrible but Savanah spoiled me - she comes on the bit and stays there unwaveringly. This is what we need to achieve. Of course as I write this I see the relationship to the trot walk transition I wrote about earlier - it's all about keeping those hind quarters engaged through the transition isn't it? I think that's going to be the theme of my next post - keeping engagement and connection through the transitions. 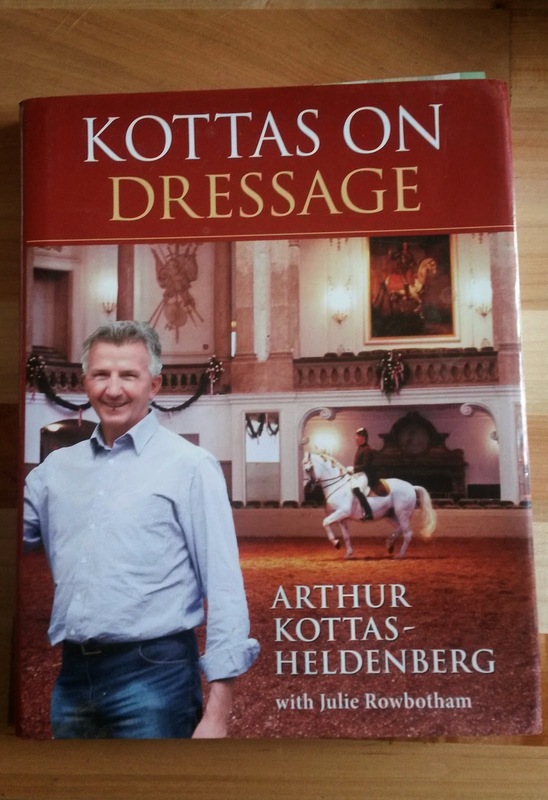 I've got some great video clips from our Arthur Kottas clinic that I can use and it will be good for me to review them. He's coming again in October so I need to do my homework! 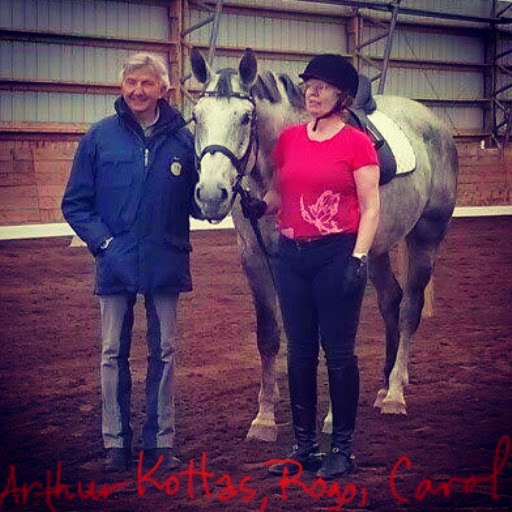 Here are a couple of pictures of him from the May clinic - one doing in hand work with Stacie Saunders and her Andalusian stallion Yovi, and one of Arthur and I. I also threw in a picture of our mare and foal for good measure. They need their own post soon. back to basics. yup. always. It sounds like it's coming along nicely. One thing I found that I was doing on Irish was that I was using too much rein to ask for the trot-walk and no leg so all the energy just disappeared out his back and our walk would be awful. It took forever to figure out how to use mostly my seat and little if any rein for trot-walk transition. I tried your stretchy trot half-halt this morning with Lucy and loved how she stretched into the outside rein. I'll add the slowing when we get this part down. It seems like a great exercise. Thanks for sharing! I like your clear, detailed descriptions. Sounds like some very useful learning. Thanks guys. Teresa it's funny you should say that because Arthur Kottas really stressed to me to use my seat more in the down transitions. Also I realized I was using more rein than I thought I was for the halt, so I think you're onto something. Annette I'm glad you liked the exercise and Kate thanks for the encouraging words! Back to basics is always a good place to refresh our riding. Love your description of the stretch circle. 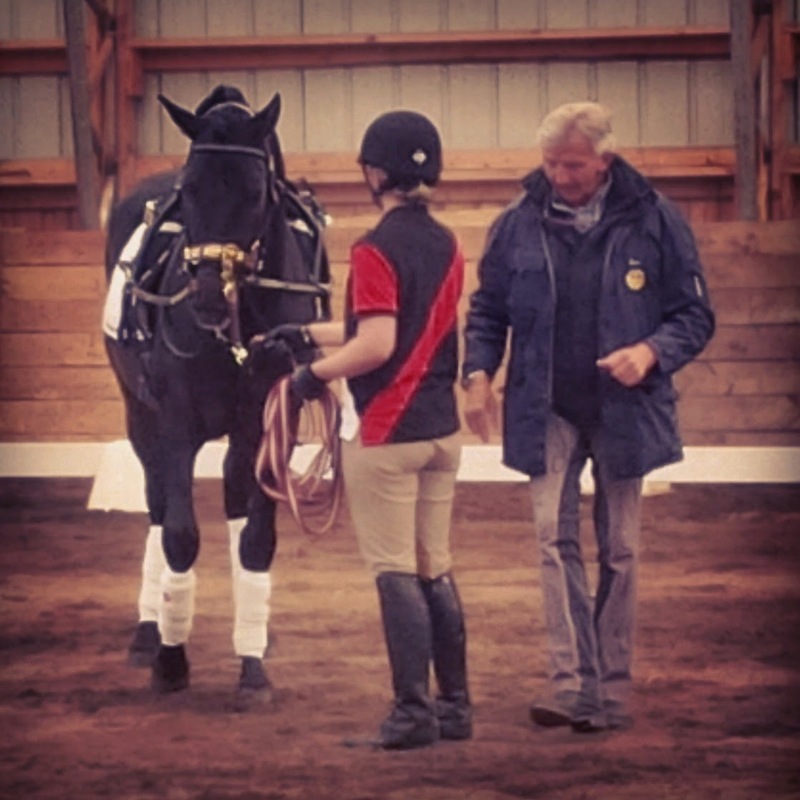 You're so lucky to have such a great teacher and be able to have Arthur Kottas do clinics there. 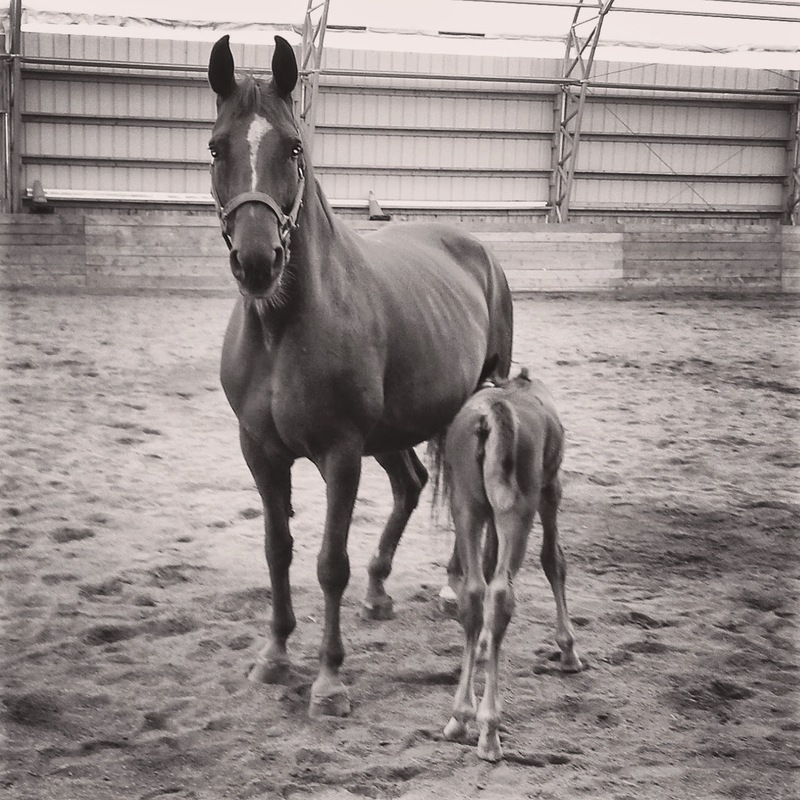 Mom and baby are gorgeous. You are cookin' Carol. I'm impressed that you had the time to share your work with us. A light rein works, doesn't it? It's hard to believe there is so much activity at 5 Fires. Seems like you were just thinking about it and now you have the premier facility of the area. All your dreams and efforts have payed off. Kudos. You guys are so kind and encouraging. Thank you so much.